What is Ear Reflexology and How Can It Help You? 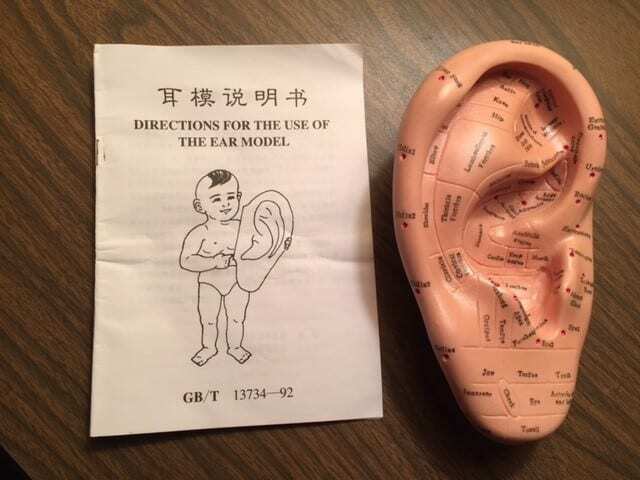 Ear Reflexology or Auricular Therapy is part of Traditional Chinese Medicine. Like hand reflexology, ear reflexology can be applied quickly and easily in situations where foot reflexology may not be suitable, or if health conditions do not permit it. Reflexology is the ancient art of healing. It can be used in conjunction with conventional treatment to obtain relief from a variety of conditions – from general stress to specific disorders. This gentle and non-invasive healing art originated in Chinese and Egyptian medicine more than 5,000 years ago. Each ear contains a complete reflex map of the body, rich with nerve endings and multiple connectors to the central nervous system. Ear Reflexology is based on zones and points in the ears which relate to energy centers known as meridian. The shape of the body is projected into the ear. The head is located in the ear lobe while the legs are located at the opposite end. Where most people have their ears pierced this is the eye reflex. Start from the top of the ear – with your index finger on top of the ear and thumb below, gently rub the outer ridge of the ear from the top of the ear to the ear lobes. Repeat step for 2 – 3 minutes. Inner ridge -With your index finger, rub the inner ear ridge from the top towards the earlobe. Repeat for 2 – 3 minutes. Inside the ear – Now insert your index finger inside of the ear (not down the ear canal) and gently rub in a sweeping motion starting from the center of the ear to the outer edge. Repeat for 2 – 3 minutes. Ear Lobe – With you index finger and your thumb, gently massage each ear lobe from one end to the other. Repeat for 2 – 3 minutes. You may also gently pull the ears in different angles to encourage blood flow for 2 – 3 minutes. Depending on how much time you have you may massage as little as ten minutes or as long as half hour. This procedure can be done on a daily basis and is extremely relaxing. Ear reflexology can help some people with migraine headaches, attention problems, pain relief, clearing infections, lowering blood pressure and balancing hormones. Click here if you would like to purchase an Ear Reflexology Model to explore reflex points on your ear. $16.95 plus $7.00 shipping. About the writer – Helen Chin Lui is a Certified Reflexologist, Certified Energy Medicine and Chakra Balancing Practitioner, Reiki Master and Teacher. Helen is the owner of the Healing Place in Medfield, Masschusetts, USA. She specializes in helping adults to find long-term relief from chronic pain, chronic digestive problems and balances hormones naturally. If you are interest how Reflexology and Reiki can help you to alleviate chronic pain, digestive pain, and balance hormones naturally, please schedule a FREE consultation online or call 508 359-6463. There are many app on line what can translate english to spanish and the other way around. I just used http://www.spanishdict.com/translation. Please email me your questions.